The legend of Nain Rouge comes from the founder of Detroit Antoine de la Mothe Cadillac almost 300 years ago. If you are unfamiliar with the story you can read about it on the Nain Rouge webpage. Short answer is that people of all ages dress up in Halloween type costumes and march in a parade to run out a evil red imp which is causing the problems in Detroit. The parade ends at the Masonic Temple where he gives a speech. Following there is a gathering inside the Masonic. 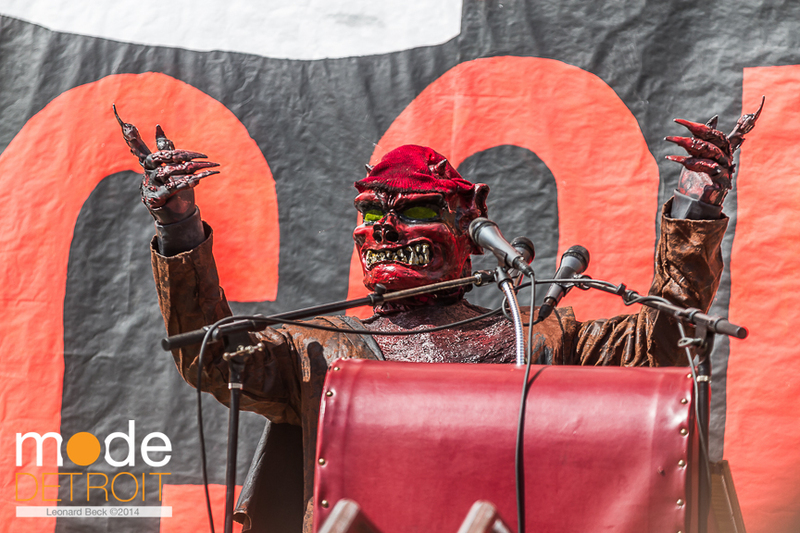 Was the Nain Rouge run out of Detroit this Year? Marche du Nain Rouge parade stepped it up this year with a huge fire breathing dragon float to transport Nain Rouge to his speech. Can people and local businesses create floats for the event? I’m sure many would if they knew they could. For this event to be get national recognition i’m sure thats a key component. The last image was my own drawing depicting the Nain Rouge to promote the event on here. Next year I plan on a whole series of images leading up to the event. Thanks Fiona. I was pretty excited when I seen the Dragon.